"Good chefs, like artists, are visionaries. You have to have a vision of the taste, the look, the smell of your masterpiece; you hold it in your mind and make it materialize." 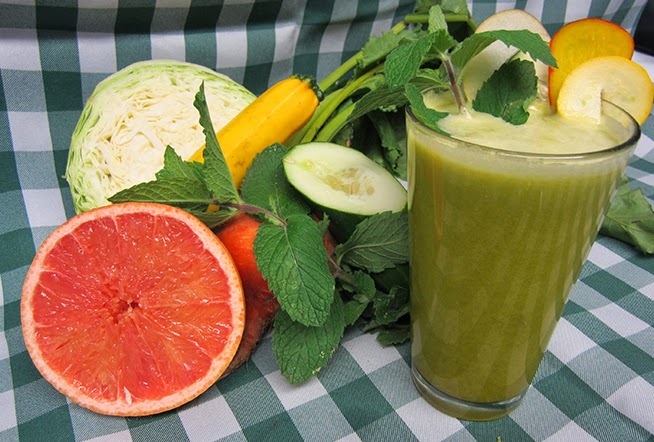 A new juice: 1 Bosc pear, 4 large romaine leaves, 6 stalks celery, 1 apple, 1 lime. Sweet. Refreshing. Slightly thick from the over-ripe pear and apple. Filling. PERFECT! AND, my favorite color of green! A sink full of veggies supplies a full day's worth of yummy nutritious jars of juice. With busy days on the calendar, it seems easiest to make my juices in the evening, sealed into glass jars, stored in the fridge, ready for my quick morning routines and exits! I have several "go-to" juices that I find travel well in my small cooler with ice packs and bottles of water. All ready to process: 12 carrots, 8 stalks celery, 3 large stalks bok choy, 1 large tomato, 1 peeled cucumber, 1 lemon, 3 cloves garlic, big handful cilantro, and 1 seeded jalapeño. I have found this juicer most efficient and faster if I cut the produce into chunks, rather than try to push things through whole. Just takes a few more minutes to prep, I have it down to an art and a science now! My newest juicer, the Jay Kordich Power Grind Pro, makes short work of the veggies. This is a hybrid juicer, with a grinding process before the centrifugal forces push the ground pulp against the spinning basket which separates the juice from the insoluble fiber. 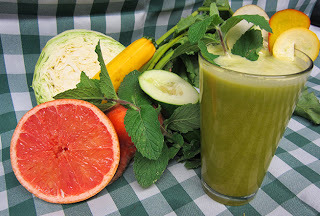 Wonderfully fresh, non-pulpy juice! Two quarts, ready to go into jars. The pint jar is Mean Green: 2 cucumbers, 8 stalks celery, 4 apples, 8 large kale leaves, 1 lemon, and a 2" knob of ginger. There WAS a quart of it - I drank the other pint for dinner as I put the rest of the juice into the refrigerator! So there is tomorrow's lunch and dinner, all done in one session with only one time clean-up! It only takes about 90 seconds to clean and re-assemble the juicer, but I usually don't have time for three juicing sessions a day. So this works for me, and ensures I have the juices I need to keep me Juice Feasting all day with no fuss. All clean, ready to go for the next juicy session. These two machines are my life-line to better health: the powerful juicer, and my beloved VitaMix! Buddies! Well, in a Vegan Taco Salad, there IS NO BEEF. HOWEVER ~ this version satisfies in every way, with taste, texture and true southwest Arizona-style flavors! Add to bowl and stir well. Spread batter about 1/4" thick on teflex dehydrator sheets; score with knife or pizza cutter. Begin drying process at 145 degrees for 1 hour. Reduce heat to 115 degrees, for 8-10 hours. (I time dehydrator projects so the longest drying time happens during the night) Flip teflex sheets over, peeling off chips onto drying screen upside-down. Continue drying to very crisp - about 4 hours or more. Serve warm for a real flavor treat! Store cooled chips in airtight container. Cook uncovered 2-3 minutes until mixture is hot through. Left-over guac (ha!) can be frozen in a snack bag - prevents darkening, and thaws quickly. The taco beans keep well for several days refrigerated; they are good as a quesadilla filling, too. I went through several days of really craving and enjoying a variety of South West flavored dishes, this was my very favorite! Starting my morning off with fresh juices seems the right thing to do here in the sunny desert! When the urge for something as light and bright as the brilliant morning light and clear blue sky strikes, this is a go-to recipe for goodness, nutrition, energy, and smiles! Wash the fruit and veggies: fill sink with cool water, stir in 1-2 T. unprocessed sea salt and juice of one lemon. Wash produce with small soft veggie brush. Peel grapefruit and beet, and cucumber if it is waxed (buy organic - no wax!). Cut produce to fit your juicer. Grapefruit has a refreshing slight bitterness. If that isn't your cup of tea, substitute an orange, peeled. Substitute 1/2" of fresh ginger root for the mint, for a totally different zing! Don't be afraid to get creative with a recipe, let your taste buds tell you when it is "perfect". Make notes so you can have the same yummy juice again! I took a bite before I remembered I wanted a photo - it just looked and smelled soooo good, my spoon did a swan dive before I could stop it! Hold onto that spoon, it will be diving right in! So I'm juicing a LOT these days, working on displacing some avoirdupois (for which my knees will be thanking me). I'm more comfortable with blending, green smoothies specifically, and use ALL the plant. But when one juices, there is "stuff" left over - fiber, to be exact. My one lonely chicken can only eat SO MUCH FIBER...so what to do with the rest? I love making dehydrated crackers and flatbread - so of course, my mind is going "Crackers, silly girl, CRACKERS!!!" I had a batch of "green" pulp from the previous day bagged and refrigerated in anticipation of this experiment. After a nice big glass of carrot-beet-celery, etc juice for breakfast, I also delegated that bag of carrot-based pulp to the kitchen lab in separate from the green pulp. Labs are for experiments, remember high school chem?? The green pulp was much more fiberous - thanks to a full head of celery down the chute. It went into the food processor for some further breakdown of those long stands - with some water, lemon juice, and lime juice to get the mass moving and working the fiber strands into shorter lengths. The carrot pulp didn't need the extra help, it went directly into the mixing bowl, along with ground flax, some spices (coriander and a nice new curry mix), and Bragg's Liquid Aminos (my pantry was out of Nama Shoyu - now on the shopping list). Using parchment (or Silpat if you are lucky enough to have some sheets just lying about doing nothing useful), I spread the cracker batter about 3/8" thick - that is NOT easy. I'm going to invest in an off-set spatula, like the pro cake decoraters use - great for spreading FLAT stuff. Scored with a sharp knife, then into a 275 preheated oven, middle rack. After about 90 minutes, the crackers were flipped onto the bare cookie pan and the parchment gently peeled off. Back in the over for what turned into several hours. Low is slow, but better, remember?! The final results had some thick and thin spots, which made crispier and chewier crackers - some were removed from pan when crisp, others left in longer to get the results I wanted. It took some shepherding, I didn't let myself get distracted by my toys because even 10 minutes in an oven operation can be the difference between tasty or too toasty!! That doesn't happen with a dehydrator, there is a lot more leeway between done and overdone...just sayin'. What could be a better nosh than crackers and some schmear? Nut based cheese schmear, that's what!! My fav is Zoe's Sunflower Spring Onion, posted previously (way previously), and a close second is either Cascadian Almond Pate' or the Cashew Sundried Tomato-Basil spread shown here with Zoe's. Notice the obvious fiber in the crackers, the pieces of partially ground flax and tiny bits of veggie fiber. Need to come up with a good name for them - "Vescuits"?? They resemble a Triscuit, only way better! Go ahead - drool - it's allowed. Can't tell you just how good these babies are - and kid tested, approved "yummy"! Never feel left out of the pizza party with this tasty raw veggie pizza! Some meaty-textured chopped mushrooms take a 10 minute swim in a simple marinade of 3 T. Bragg's Liquid Aminos mixed with 2 T. agave, a squeeze of lemon juice and a couple cloves of garlic, minced. Drizzle some lemon juice all over the inside of the cap. 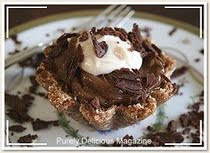 Spread a tablespoon or two of raw almond butter or tahini in the cap. Layer the veggies, then top with the marinaded mushroom bits. A generous sprinkle of nutritional yeast adds lots of B12 and cheesy flavor. Lastly, a crown of basil chiffonade. Slice your creation into wedges, and enjoy the fresh flavors! You will never go back to the heavy bread version. I LOVE Green Smoothies!!! I have them every single day! They start my day with sunshine, energy, and yummy-licious flavor. This one began with watemelon, bananas, strawberries, then some celery, spinach and fresh ginger. Blitz in the VIta-Mix and wa-lah: breakfast (and lunch and snacks and sometimes even dinner) of Champions! And now I'm drooling - and heading for the kitchen! VITA-MIX THE ULTIMATE KITCHEN TOOL!! After a heart attack and a bout with colon cancer, I started fine tuning my eating choices. Over the past three years I've gradually moved closer and closer to the foods that seem to make my body happiest. Eating raw has been, and continues to be, a quest that I enjoy and appreciate. From A to Z, the plant world nourishes me - heart and soul! Get the Vitamin Wheel widget and many other great free widgets at Widgetbox!